Shore Up Your Enrollment All Summer Long! Talk to parents about their summer plans so you can better anticipate your summer enrollment and plan accordingly. Ask parents if/when they’ll attend during the summer, why or why not, and when they’re away on vacation. You can create a simple, free survey using Google Forms or SurveyMonkey, and send it to parents via email. Start sending emails or notes home now to remind parents that Musikgarten is just as fun in the sun! Let them know now if you’re planning an alternate summer schedule so they don’t miss a beat. Consider adding a few extra daytime classes for parents, sitters, and summer camps looking for ways to keep little ones busy. They’ll thank you! Reach out ASAP to nearby camps and churches, YMCAs, and day care centers offering summer programs. Camp directors are always looking for local, affordable activities; they may bring you new students by the busload! If space is an issue at your studio, take your Musikgarten to the camp and be sure to supply take-home information. Offer summer specials and limited-time promotions. Consider an exclusive summertime rate for current families to encourage them to stick with your studio all season. Consider adding a flexible, drop-in class for parents and sitters battling boredom and rainy day blues – your studio can be a real sanity saver! Spring and summer means lots of family-friendly outdoor events and festivals popping up in every town. Check with your local paper, convention and visitors bureau, or city website for a calendar of upcoming events. Then contact the organizers about hosting free, interactive music activities for kids; be sure to bring flyers or cards for parents! 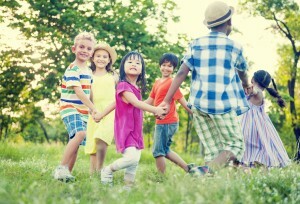 If you have the space and resources, consider offering a half- or whole-day Musikgarten camp. Musikgarten curriculum can be one part of the daily schedule; you can fill the rest of the time with music-themed arts n’ crafts, games, activities, and even movies. Here’s a list of age-appropriate musicals and musical movies. Don’t stop marketing your Musikgarten! It can be temping to take a break, but keep up your marketing and social media efforts: a new summer student may turn into a year-round enrollee! Need new marketing ideas? Click here! 11. Go outside! Plan a nd promote a few classes “al fresco” – have parents meet you at a local park or under a shady tree near your studio (of course, get permission if it’s not your property.) Ask families to bring picnic blankets or beach towels, and water bottles. Encourage children to listen to the music of nature, like birds singing and leaves blowing in the breeze. You can even have an impromptu summer parade! Are you ready for summer? We are! Tell us how you keep your Musikgarten growing all summer; email us here. Do you have children with special needs in your classes? Then you know the joys and challenges that come with welcoming exceptional children into your studio. Parents may email or call you to ask if their child with special needs will be able to participate in Musikgarten. One teacher in North Carolina rightly explains to curious parents that: 1) Musikgarten welcomes all children, 2) music education can benefit children with a variety of needs, and 3) together they can work to determine if Musikgarten is the right place for their unique child. Today, this teacher has students with ADHD, autism, Down Syndrome, and cerebral palsy actively participating – and flourishing – in her studio. Music is multi-sensory. Children with special needs often learn in different ways. Playing music engages them in tactile learning, kinesthetic learning, auditory learning, and visual learning. Music activates both sides of the brain. The Cognitive Neuroscience of Music shows that when making music, the auditory cortex, hippocampus, amygdala, prefrontal cortex, visual cortex, sensory cortex, cerebellum, and motor cortex are all activated. Music is motivating. Everyday activities can be hard work for children with special needs. For a child struggling with motor skills or coordination, Musikgarten can encourage them to step, shake, bang, tap, clap, and move in a way that’s fun, not frustrating. Music can be non-verbal. Exceptional children are often non-verbal or may struggle with verbal communication. When words fail them, music gives these children a wonderful way to understand and process information, express themselves, and connect with the world around them. Pattern work is the perfect bridge to aid verbal communication. Musikgarten is a social experience. Musikgarten is no substitute for a child’s private therapy sessions, but Musikgarten can help them to practice the skills they’re working on in a fun and social environment. And for very shy children or those who struggle with social interaction, Musikgarten provides a place for them to be with other kids and interact in a structured, yet playful, way. Music is multi-beneficial. Music education nurtures confidence, coordination, concentration and persistence while teaching children how to listen, follow directions, take turns, and participate. Musikgarten helps parents and children bond. Often, parents of children with special needs struggle to connect emotionally with their child. Music and Musikgarten classes can help unlock this connection by fostering both physical and emotional closeness between parent and child. Now that you know the benefits of music and Musikgarten for children with special needs, how can you make your studio even more welcoming? Reach out to local schools and care centers that serve children with special needs to offer classes on-site or to invite parents to attend a free demo class at your studio. Include messages of inclusion in your newsletters or on your social media pages. Show the diversity of your classes so parents know Musikgarten is a welcoming place. Spend some time with parents to understand their child’s unique needs and challenges, the skills they’re working on in school or therapy, and to ask how you can help accommodate their learning needs. There are often simple solutions to tricky problems: One teacher told us about a student with autism who refused to hold instruments with wooden handles because they felt too hard and uncomfortable. The teacher slipped socks over the handles, and the child very happily started to participate. Ask parents to participate and help. Don’t be afraid to “put them to work” to assist their child in class. On the other hand, encourage parents to step back and let go. Independence is a great indicator of progress! Set professional boundaries. Let parents know that you’re not a music therapist, speech therapist, or occupational therapist, but that you would be happy to take suggestions from them and their child’s therapists to make their Musikgarten experience as beneficial as possible. If you are trained in music therapy, be clear about your role as a Musikgarten teacher and manage parents’ expectations of you and your time in class. Ask about progress. Children with special needs may not appear to make progress as quickly or in the same way as your other students. They may not be as expressive in class. However, parents often report that their child sings or dances in their own home environment. Ask parents what they’re observing outside of class to better understand how their child is growing. Helpful hint: If you or a parent feels a child may benefit from music therapy, refer them to a Board Certified Music Therapist. To find a Board Certified Music Therapist in your area, visit MusicTherapy.org. Tell us how you create a welcoming and inclusive environment for students with special needs. Email us here.